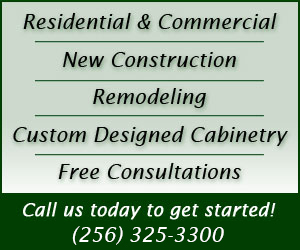 Southern Pride Custom Cabinets offers free consultations for any project – large or small. We will provide a free estimate upon visiting your job site, reviewing blue prints, and measuring when available. Our skilled designers will develop a set of 3D prints representing the desired layout of cabinetry in your home or office with no consultation fees. © 2017 Southern Pride Custom Cabinets. All rights reserved.